The space is narrow, long and tall. On the back feature wall, a photograph of spectators wearing “GoPre” t-shirts is magnified. The image is from a race that Steve Prefontaine was competing in, the legendary, American long-distance runner who’s thought to have kick started the running boom in the 1970s. 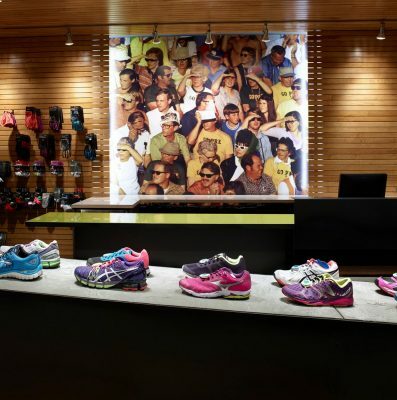 While there’s no image of Prefontaine himself inside the space, he served as an inspiration for the design. An irreverent runner who said it took guts, not speed, to win races, many will recognize the image’s connection to the iconic runner merely from the spectators’ t-shirts, thus acting almost like a secret handshake among long-distance runners. 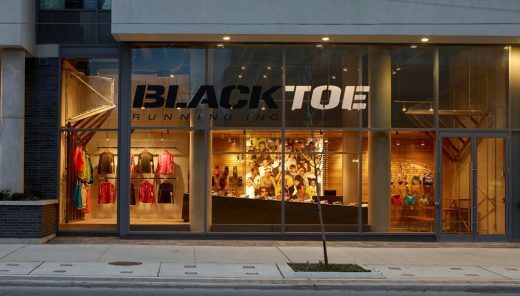 The name of the store is also a nod to runners – Black Toe is a condition where a toenail turns black and eventually falls off from constant running, a rite of passage for long-distance runners. 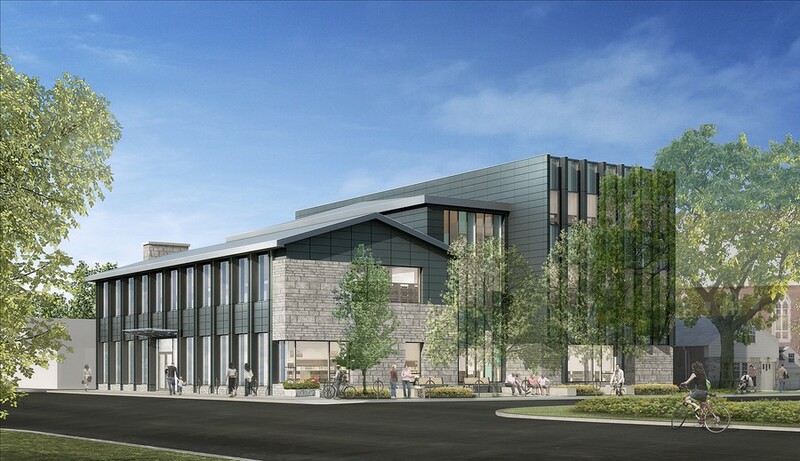 Principal John Tong worked closely with his client to design a dual-purpose space that connects with the culture of the elite runner, striking a balance between design and function, elegance and the surrounding landscape. 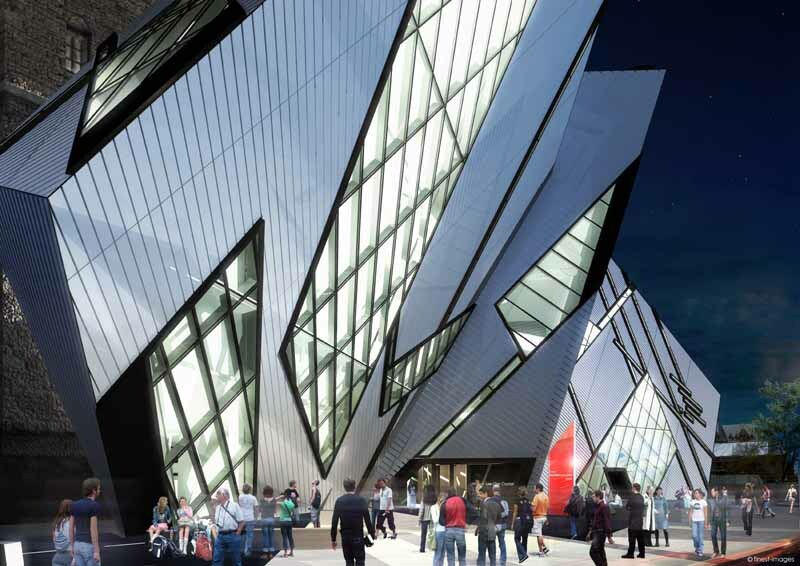 He chose urban materials such as concrete, slate, wood and chain link to emphasize the environment where many Toronto runners train: along the waterfront and major streets, beside railway tracks, ravines and city parks. The space flows in a circuit around a black steel monolith artfully displaying Black Toe’s shoe selection. 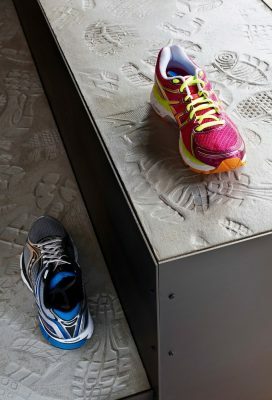 Topped with concrete, the centerpiece features the footprints of local runners from the community. A terrain is created with one side of the display subtly ramping up to a raised platform area where a few shallow steps then lead you down to the other side. To accentuate the clean lines and the dynamic shift in elevation, Tong split the case down the middle. 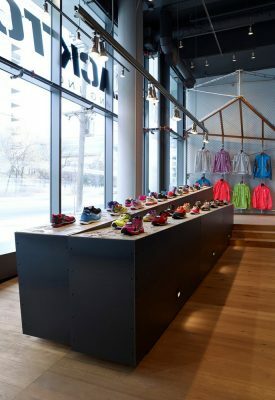 Oak planks were chosen for the path, riffing on the look of a boardwalk, lit by small exterior lights usually found outside on walking paths – a balance of the outdoor-meets-indoor language. “We tried to create a terrain which is tactile yet urban and man-made,” says Tong. 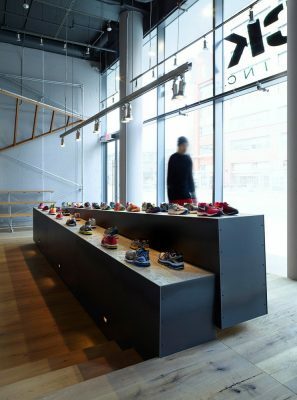 Unlike most running shoe stores that overwhelm with their walls of shoes on tiny shelves or pegs, Tong’s intention was to focus attention on the main products at Black Toe on a display at table and counter-height. 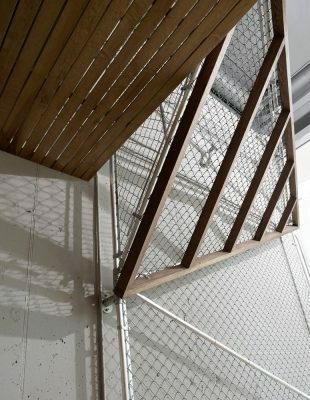 Flanking the ends of the store are large sculptural elements made of chain link fencing and geometric wooden structures cantilevering forward, which speak to each other from across the space. 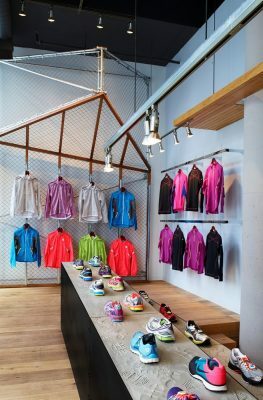 To exaggerate the height of the store, the ceiling above the counter was compressed by creating a second, lower ceiling of wood slat fencing. On one side of the store, multi-purpose bleachers were constructed. 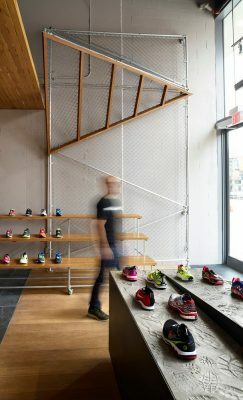 “Visually, it signals social gathering, anticipating a senses of spectacle,” says Tong, “but it’s also purely functional as a place to try on shoes and display products.” The bleachers also will be used as a hub to host seminars and events, as well as the meeting place for group runs Black Toe plans to organize. Meanwhile, the glass counter top towards the back of the store performs double duty as a place for the cash register as well as a consultation bar with stools. A drinking fountain is located nearby for runners to stop in and fill up their water bottles. 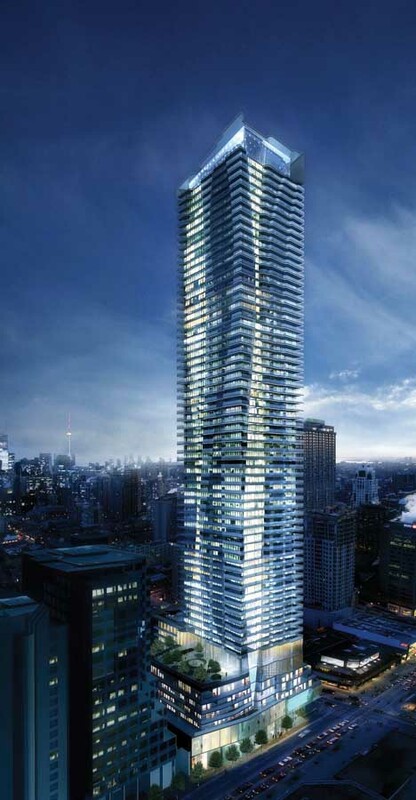 Formerly a founding principal of interior design firm 3rd Uncle Design, +tongtong principal John Tong (B. 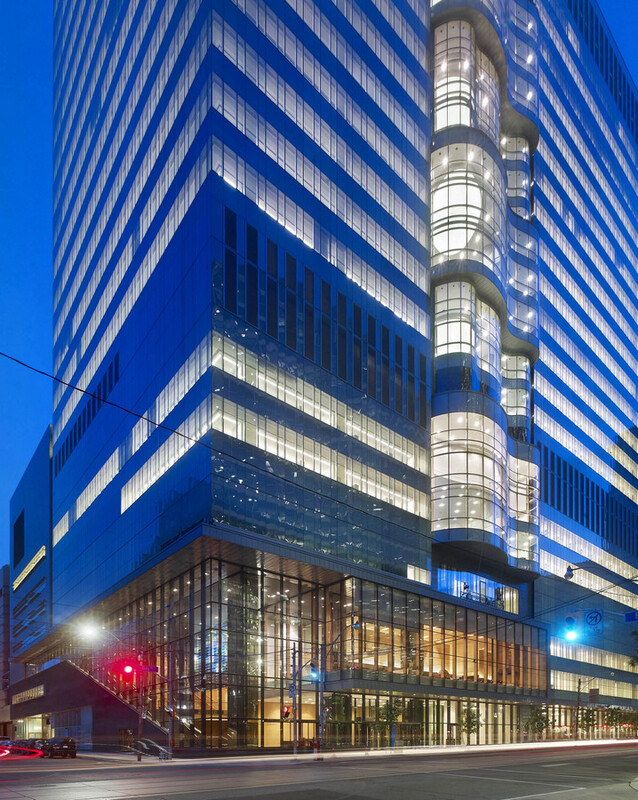 Architecture from the University of Toronto, 1992), is currently working on a diverse range of projects including his continued work on the Drake Hotel’s new Prince Edwards County off-shoot, Drake Devonshire Inn; the Delta Hotel in Waterloo, Ont. ; a Spanish concept restaurant in the St. Lawrence Market; and several custom residential projects across Canada and the United States. 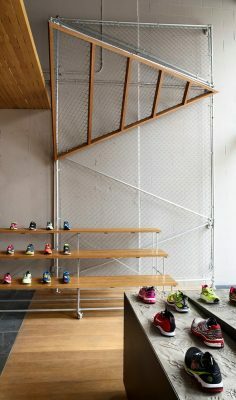 +tongtong recently renovated a mid-century poolhouse in Toronto as well as designed a retail store Annie Aime in Toronto.